* Contemporary grille size: 13 Sq.In. 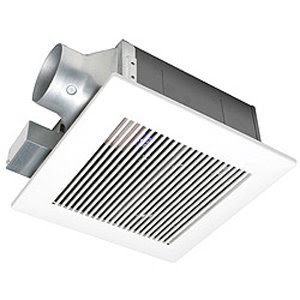 The Whisper Fit low-profile bathroom exhaust fans by Panasonic are designed for buildings with smaller ceiling cavities. The bathroom fans have an enclosed condenser motor and double suction blower wheels to ensure super-quiet operation. The ventilation fans also have a built-in damper that prevents backdraft. The efficient Energy Star® qualified fan has a cool running motor that keeps the fan from creating excess heat. The bathroom fans are available in 50 CFM, 80 CFM and 110 CFM models and work with a 4" or 3" duct size. A 3" adapter is included.